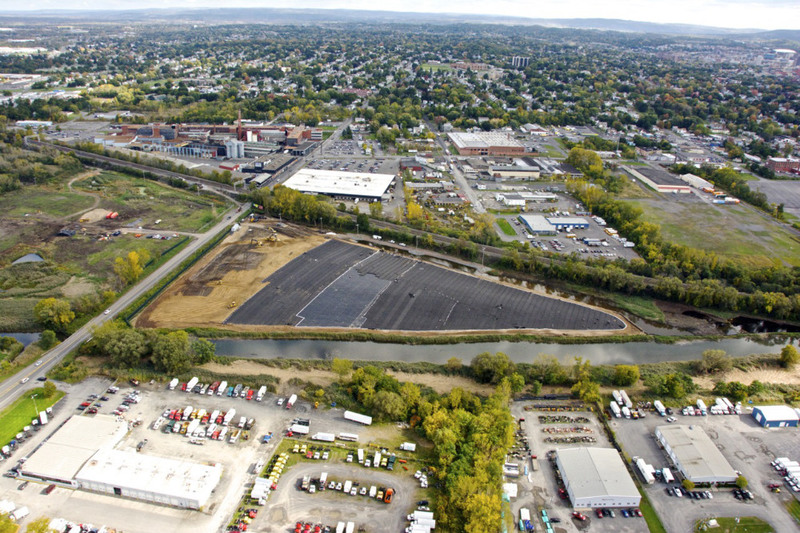 NRC performed the remediation and closure of two landfills on a 41-acre site in Syracuse, New York. The adjacent landfills, measuring 20.5 and 19.5 acres, accepted municipal waste from 1960-1965 and industrial waste from 1960-1969. The scope of work involved clearing and grubbing of the site, waste and sediment excavation up to 18 fbg, and consolidation of material within the design area of each respective landfill. An engineered cap system was placed over the consolidated material to meet the requirements set forth in 6 NYCRR Part 360, which included a passive methane gas venting system. Throughout the project, approximately 114,000 CY of impacted material was excavated. A similar volume of clean material was imported to the site and utilized for a minimum 30’ wide buffer zone between the landfill and surrounding bodies of water and adjacent properties. Collectively between the two landfills, over 3,000,000 square feet of geosynthetic materials was installed as a landfill cap system which consisted of a 270-mil geocomposite gas venting layer, followed by a 60-mil double sided micro-spike linear low density polyethylene (LLDPE) layer, and a 270-mil geocomposite drainage layer. Over 10,000 LF of HDPE piping was fusion welded and installed as a passive methane recovery system. Additionally, approximately 1,100 ft. of vinyl sheet piling was installed to separate material from an adjacent off-site property to depths of up to 18 fbg. Site support tasks consisted of community and work zone air monitoring, creek bypassing, on-site dewatering and solidification with NYSDEC approved imported cement kiln dust, on-site water treatment and sanitary sewer discharge, sediment and erosion control measures, installation of NYSDEC approved wetland plants; and coordination with a local power company to de-energize and removal active 34-kVA power transmission conduit and towers from the site. Excavation of over 114,000 cubic yards of soil and sediment. Installation of 5,975 LF of drainage swale. Installation of 4,200 LF of perimeter fencing. Installation of over 41 acres of geomembrane and capping system.